My mother had always insisted that her mother was an amazing baker, and her challah was second to none. So, when I first started baking challah, I wanted my grandmother’s recipe. But my grandmother wasn’t available for asking. She was dead, murdered by the Nazis. But I wanted to bake. I wanted to stretch my muscles, dirty my fingers, and knead my prayers into my dough as I imagined my grandmother had done. “Are you sure you don’t remember?” I prodded. From Torah classes, I knew about the Showbread of the Holy Temple, the Lehem HaPanim, and about the Matriarch Sarah’s challah—both of which remained fresh throughout the week. Since my grandmother was a rabbi’s daughter, I imagined that by saving this piece, my grandmother was copying Sarah and the ancient Temple priests. But who could be sure? I never imagined that I’d solve the mystery of this esoteric ritual—and that it would lead me to a deeper connection with my grandmother. Born at the turn of the 20th century in Czenger, in northeastern Hungary, Cecilia Tzirel Blau was the fourth of six children. An intelligent child, she attended school until she was 16, a long time in those days. In her early twenties, she married Chaim Bleier, a handsome former yeshiva student and World War I veteran who was 10 years her senior. Less than a year later, she gave birth to a son and named him after Theodor Herzl; he died in infancy. During childbirth, my grandmother contracted puerperal, or childbed, fever, which almost killed her. Her doctor ordered her to stop having children, but the following year she became pregnant again. Like the biblical matriarchs, her desire to give life outweighed her desire to live. Again, she became ill, but this time both she and the baby survived. That baby was my mother, my grandmother’s only child. In 1930, my grandfather immigrated to America illegally. He planned to bring over the rest of the family, but by the time he could afford boat tickets, war had broken out. In the spring of 1944, my mother and grandmother were deported. Upon their arrival at Auschwitz, a man approached them. “Nisht a tochter und a mama—shverstern,” he said: You aren’t mother and daughter—tell the Nazis that you are sisters. The Nazis were only interested in keeping young people alive, so they could work; if they’d known my grandmother’s actual age, she would have been sent to the gas chambers. The scam nearly worked. My grandmother survived for six months. Then in October 1944, as she and my mother were being moved to another camp, my grandmother vanished. “I turned around and she was gone,” my mother recalled. No one knows whether she was shot or gassed or beaten to death. Every year on the day after Simchat Torah, my mother lights a yahrzeit candle. I am my mother’s first child and only daughter. From my grandmother, I inherited my name—Carol is an Anglicization of Tzirel—my high cheekbones, my curly hair, my love of books and, according to my mother, a passion for baking challah. Over time, I’ve learned about other challah recipes, shapes, and braiding techniques. I’ve heard of 12-braid challah, challah baked with chocolate chips, challah shaped like a hangman’s noose (for Purim), but I could never find a recipe that mentioned my grandmother’s practice of saving dough. 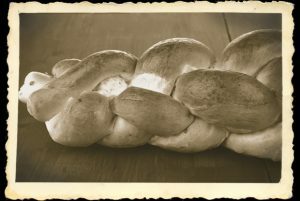 From my own research into Jewish culinary history, I knew that barches was a European name for challah, an acronym of the phrase birkat Hashem hi teasher—the Lord’s blessing brings riches. But I’d never heard of sourdough challah. I knew enough about baking, however, to know that sourdough involves a starter, essentially a bit of fermented dough that’s saved from week to week. Could it be, I wondered, that my grandmother’s saved piece of dough was actually sourdough starter? I phoned my mother. Like a detective ferreting out evidence, I was careful in my questioning. That would be a telltale sign. Sourdough starter required an earthenware or glass home to survive. “It was a crock,” she told me. That was it. My story about my grandmother emulating Sarah the Matriarch, carrying on the ancient tradition of the Showbread from Temple days, was as phony as Bernie Madoff’s stock fund. But I didn’t care. I was thrilled! There was no grave to visit, and only some photographs and tablecloths as mementos of a woman I never met, so this recipe would take me as close as I could ever get to her. I got to work making my first ever batch of sourdough starter. Following the instructions in Joy of Cooking, I combined flour, water, and yeast into a substance that looked suspiciously similar to beige house paint. For a week, my starter sat on my windowsill shrouded with a white dishtowel. Like an anxious mother of a newborn, I checked it constantly, stirring it every so often with a wooden spoon to bring on the desired chemical reaction. As Irma Rombauer writes in Joy of Cooking, sourdough is for the “adventurous, persistent and leisurely cook.” After a full week, my starter bubbled and let out a strong smell, which I hoped indicated that the desired fermentation had occurred. Using the starter, I tried the Rich Sourdough Barches recipe from Inside the Jewish Bakery, which the authors say is adapted from the Trumat HaDeshen, the writings of 15th-century sage Rabbi Israel ben Petachiah Isserlein. Excited as I was to be taking this journey into culinary history, the cookbook’s description of a “pronounced sourdough flavor” made me fear that my challah would taste acidic, and the dough’s firmness and long rising time made me worry that my barches would be tough. So, I hedged my bet and made sourdough barches rolls instead. Since rolls weren’t quite as majestic as full-sized challahs, I reckoned that I wouldn’t feel quite as devastated if they ended up in the trash. Throughout the baking, I kept opening the oven door to check that my rolls were rising. When they finally puffed up, I could hardly wait to taste them. I hoped they’d be good; I didn’t want to think that my grandmother, in whose memory I was doing this, baked lousy bread. I wasn’t disappointed. Savory and strongly flavored, the rolls were wonderfully hearty, like good country bread. The following Thursday, I used the recipe to bake two wonderful loaves of challah. Since then, I’ve become a little addicted to sourdough, replenishing the starter and baking every week. They say that the dead know the affairs of the living. Could it be that my grandmother watches me as I try to copy her? If she is, I hope she’s smiling. 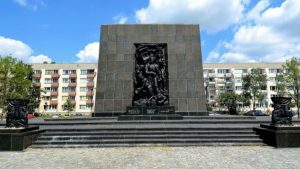 The Jewish Historical Institute said it will open an exhibition dedicated to the Ringelblum Archive, which chronicles the history of the Warsaw Ghetto. Poland’s chief rabbi, Michael Schudrich, met with the daughter and other descendants of Poland’s iconic interwar leader Marshal Jozef Pilsudski. During their hourlong conversation Thursday, Jadwiga Jaraczewska, 94, showed Schudrich a famous photograph of Jewish leaders in the town of Deblin greeting her father with bread and salt after the Polish army under his leadership captured the town from the Bolsheviks in August 1920. Also present at the meeting, which came at the invitation of the family, were Pilsudski’s grandchildren, some of his great-grandchildren and his 2-month-old great-great-granddaughter. Polish Jews widely supported Pilsudski, who died in 1935, as an opponent of extreme nationalism and anti-Semitism. He served as head of state and prime minister, among other positions, between 1918 and 1935, the end of World War I and the beginning of World War II. The most significant moment at the Eichmann Trial occurred when the Polish-born writer Yehiel Feiner collapsed while testifying on the stand in Jerusalem, after he was asked a simple procedural question at the beginning of his testimony—the reason why he concealed his identify behind the pseudonym Ka-Tzetnik 135633 (Ka-Tzetnik is the Yiddish term for a concentration camp inmate). Later in his testimony, Ka-Tzetnik stood and turned around, and he then collapsed on the ground. 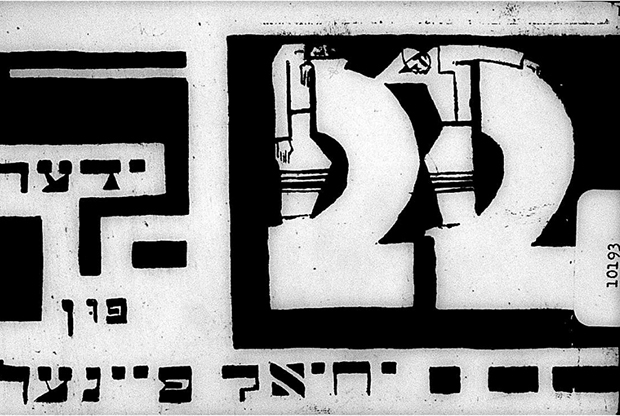 In his Tablet article, Mikics recounted the story about how, in 1993, when Ka-Tzetnik was told that a copy of his 1931 collection of twenty-two poems was available at Hebrew University’s National Library of Israel, “he stole it, burned it, and sent the charred remains back to the library with the instruction that the rest of it should be reduced to ashes, like all of his pre-Auschwitz existence.” His request to the director of the library’s circulation department was, “to burn the remains of his book just as my world and all that was dear to me was burnt in the Auschwitz crematorium.” For the past few decades, whenever scholars analyzed the literary writings of Ka-Tzetnik, they have focused on Salamandra and House of Dolls, owing to the fact his 1931 volume was removed from circulation by the author himself. But in what is being presented as a major find, the Kestenbaum & Company auction house in New York City recently announced that Lot 119 of their June 26 auction was an autographed first edition, with photographic frontispiece, of Yehiel Feiner’s 1931 Tsveyuntsvantsik—“Twenty-Two Poems”—which they describe as “possibly the only complete copy extant of … Ka-Tzetnik’s immensely scarce first book written in his youth in Poland, of the utmost rarity.” The sale price for Thursday afternoon is estimated at $7,000-$10,000. Upon seeing the auction listing, I reached out to Professor Yehiel Szeintuch, who informed me through a colleague that though Ka-Tzetnik famously destroyed a copy of Twenty-Two Poems from the National Library of Israel, Szeintuch has since replaced the copy from his own collection. Seeking to further establish the rarity of the volume at auction, I also walked into The YIVO Institute for Jewish Research in Manhattan and, after some research into Ka-Tzetnik’s various publications that are available in their great Yiddish archive, a copy of his work was located within The Vilna Collection, the surviving remnant of YIVO’s prewar library from Vilna. I reached out to Kestenbaum & Company and asked whether they are aware that copies of Ka-Tzetnik’s Twenty-Two Poems are currently available to be studied at the National Library of Israel and at the YIVO Institute for Jewish Research in New York, among other research institutions, and if this detail will be made known at the auction on Thursday afternoon. A Kestenbaum representative responded that “the copy contains the exceptionally rare frontispiece photographic portrait of the author,” and that they will not announce that there are, as well, several academic libraries that also have copies of Ka-Tzetnik’s Twenty-Two Poems available to researchers. THE HAGUE, Netherlands (JTA) — A Dutch Jewish broadcaster is co-organizing the launch of an annual Holocaust commemoration event featuring theater shows about Anne Frank and other victims at their former homes. A blueprint of the event by the Joodse Omroep Jewish broadcaster, or JO, and its Christian partner, the Evangelische Omroep, or EO, was leaked last week to the Dutch blog GeenStijl.nl. According to the blueprint, the event will launch on May 4, the Netherlands’ official day for Remembrance of the Dead, at several locales connected to Anne’s life. The concept has participants walking in a silent procession from one location to another in Amsterdam, the Dutch capital. The project aims to produce “an integrated account of a victim and their personal story in a way which places the lessons of the past at the center of the present,” according to the leaked document, which also describes the initiative as a way to combat persistent anti-Semitic attitudes and indifference and ignorance of the Holocaust among young Dutch people. According to the document, National Remembrance Walks from 2016 onward will focus on other Holocaust victims from elsewhere in the Netherlands, which lost 75 percent of its Jewish population of 140,000 in the Holocaust, the highest death rate in Nazi-occupied Western Europe. The concept, which was drawn up with assistance from the communications firm Eye2Eye Media, has Dutch actress Carice van Houten of the hit series “Game of Thrones” portraying Miep Gies, a resistance fighter who tried to save Anne Frank and her family during their two years in hiding from the Nazis before their capture in 1944. The cast will include additional Dutch actors and celebrities, and the walks will feature public singing of songs from World War II, the concept said. But in a statement on Twitter, van Houten wrote that she had been unaware of the plan before it was leaked. It’s a scenario that the Yiddish writers of yore could never have predicted, and yet by which they likely would have been tickled: Today, their work is being digitized with the help of a home-made scanner built by a former Baptist from Indiana who lives in the Crown Heights section of Brooklyn. As of mid June, the scanner is the newest acquisition of the National Yiddish Book Center, in Amherst, Massachusetts. It will be used to digitize the center’s books — some of them a century old — that are stored in a climate-controlled vault. 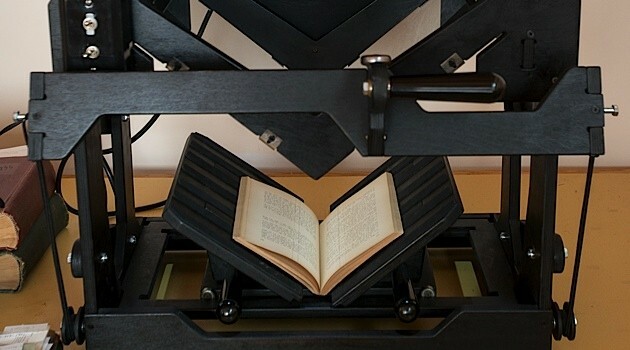 The new scanner, which uses two Canon DSLR cameras to capture the Yiddish text (without cutting books), was donated to the center through circuitous means. A New York software executive (who asked to remain nameless in the Jewish tradition of anonymous giving) originally purchased a kit for the scanner from Daniel Reetz, creator of the do-it-yourself book scanner project. The executive was unsure of what he would do with the scanner. His wife had been in touch with an Australian living on a kibbutz in Israel, who had been involved in digitizing yizkor books — that is, books written by Holocaust survivors to commemorate the communities that were destroyed. The Australian put the executive in touch with Joel Alpert, a retired electrical engineer in Boston who was involved in efforts to publish hard copies of the yizkor books. Alpert was aware of the National Yiddish Book Center’s need for a scanner. Lantos, a staunch human rights advocate who died six years ago, was honored June 21 outside the Budapest house where he lived during World War II. The ceremony came at the 70th anniversary of a Nazi decree forcing Budapest Jews to live in houses marked with a yellow Star of David, an “honor” unique to the community. Budapest Jews lived in more than 2,000 marked homes until the city’s ghetto was established in November 1944. Lantos was arrested by the Nazis at 16 and taken to a forced labor camp outside of the city in early 1944. He escaped twice and in March 1944 returned to Budapest where he lived for six months in a yellow-star house set up by Raoul Wallenberg along with another 70 Jews, including his aunt. 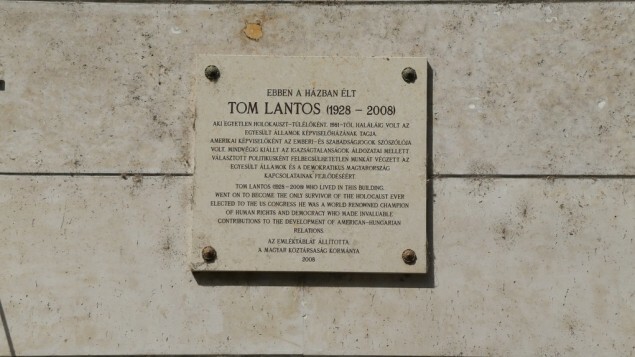 Lantos participated in the anti-Nazi resistance until the end of the war in 1945, when he discovered his mother had perished in the Holocaust.